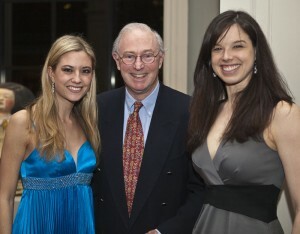 On March 4, 2010, Hope Funds for Cancer Research held the second in a series of panel discussions on translational cancer research, in Boston. 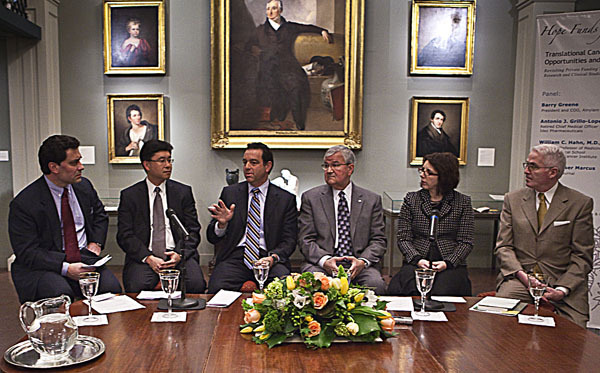 Five distinguished panelists addressed “Translational Cancer Research: Opportunities and Challenges; Revisiting Private Funding’s Role in Advancing Compounds through Clinical Studies,” to a highly distinguished and engaged audience at the Boston Athenaeum. 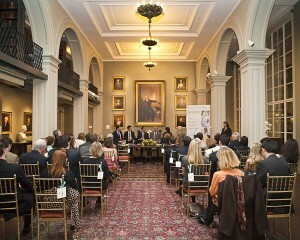 Moderated by Hope Funds Trustee Charles V. Baltic III, the panelists were: Barry Greene, Chief Operating Officer of the RNAi biotechnology company, Alnylam; Antonio J. Grillo-Lopez, M.D., retired Chief Medical Officer of IDEC Pharmaceuticals and lead developer of Rituxan and Zevalin; William C. Hahn, M.D, Ph.D., Associate Professor of Medicine at Harvard Medical School; Amy Dockser Marcus, a Boston-based reporter for the Wall Street Journal reporting on rarer cancers; and John K. Naughton, The Ford Foundation’s project coordinator for GrantCraft. The panelists addressed the need for bringing better cancer therapies from the laboratory to the patient faster. While these experts noted the current hurtles being a shortage of funding, regulatory issues and the need for more cooperation between institutions and industry, they brought to light ways of speeding up the process. The panelists agreed that the foundation of drug development is basic research, and this is the greatest time in history to for innovative research. The panel expressed strong sentiment that patients need to be an integral part of the process, both as advocates and as partners in drug development. 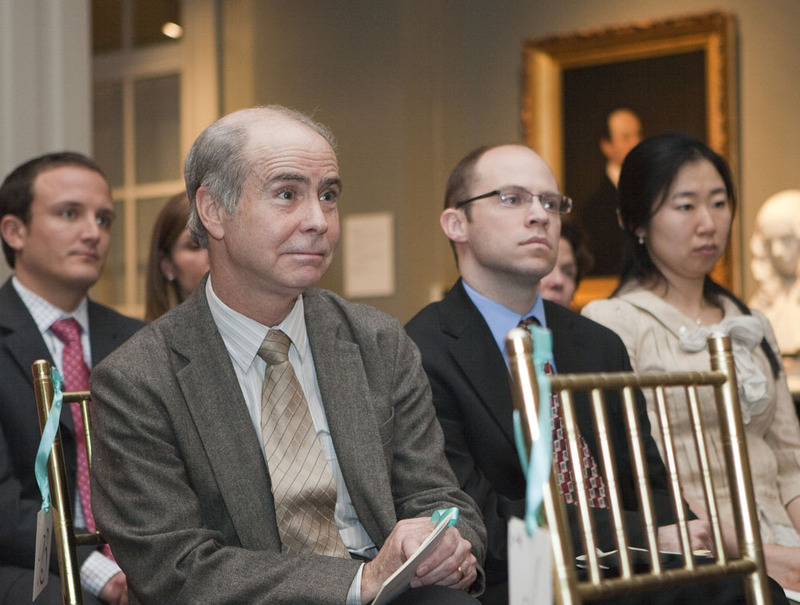 The panelists discussed the need for funding along the continuum of translational research, from basic science grants to strategic investment by industry and institutional investors. 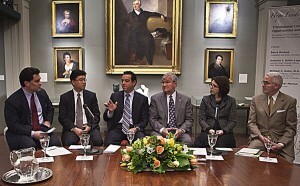 An exciting option discussed was the use of program-related investing. This financing vehicle is available from the non-profit sector and allows charities to make investments ranging from basic science grants in the non-profit’s mission area, to funding later-stage clinical trials that are in the mission area, even in public companies. It was stated that while this financing option is about 30 years and relatively small, it is starting to become more recognized, and double in size last year. The Panel Discussion was followed by a Reception and Poster Session with three of the Hope Funds Postdoctoral Fellows: Pedro Medina, Ph.D., from Yale University; Nathan Robison, M.D., from Harvard University; and Xiaoxing Wang, Ph.D., from the Dana-Farber Cancer Institute. 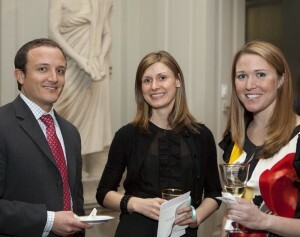 The evening raised funds for postdoctoral fellowships in cancer research.